Khin drums have a long history of contributing to the life of the Baye Fall community. Khin is an instrument typical of the Serer of Senegal, used to accompany zikr during Baye Fall ceremonies. A wide variety of rhythms can be observed depending on the kind of celebration for which the drums are used, going from slow to fast, with an ability both to possess or enlighten the people involved. 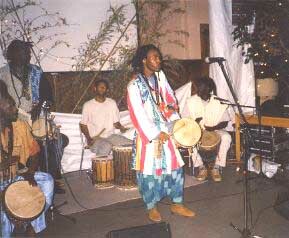 Baye Fall drumming is the most common way to convey an energy that harmonises the whole body and soul. Drumming and chanting reach a level of intimacy independently and collectively which Baye Fall would never have experienced without those elements of nature which constitute the khin drums. Khin drums are used during planting and harvesting of crops by Baye Fall who express their devotions through work. Khin drums have also the power to heal people and reveal to them their authentic freedom. Drums and vocals are united as a medium for the worship of God.